BEIJING — A prominent Chinese human rights campaigner accused of inciting subversion of state power said at his trial Tuesday that he had used social media to inspire distrust in the Chinese government before being detained in a sweeping crackdown on independent lawyers and rights activists. Parts of the trial of Jiang Tianyong were broadcast on the social media account of Changsha Intermediate People's Court in the central province of Hunan, an unusual move for such a politically sensitive case. Prosecutors said he had used social media platforms to denigrate the government and judicial authorities and incite others to subvert state power. Jiang was filmed saying he had used Twitter and Sina Weibo and interviews with overseas media to spread anti-government messages among the public. "I wanted to ... mislead internet users into hating our country's current social system and into sharing my own sense of dissatisfaction with society, in order to inculcate hopes of changing the current social order with the goal of subverting our country's current social order," Jiang said in the footage. He wore a short-sleeved white shirt and sat alone in the middle of the court. Jiang was initially charged with subversion of state power, but it was downgraded to the lesser charge of incitement, which is often punished with time served while under investigation. Vaguely defined subversion-related charges are frequently leveled against rights activists and perceived political foes of the ruling Communist Party. Frances Eve, a Hong Kong-based researcher at the Network of Chinese Human Rights Defenders, called Tuesday's hearing "a pre-written piece of theater" and said that "as expected under the circumstances, Jiang confessed at the end." "He was held in a secret location for six months and never given access to the lawyers hired by his family. Any confession under these circumstances wouldn't hold up in a truly independent court," Eve said. Jiang was taken away by state security agents in November and in March purportedly gave an interview to a state newspaper and was shown on state TV saying that he had made up a story about a lawyer, Xie Yang, being tortured. Jiang's wife and rights groups said the supposed confessions were a sham, and his legal team questioned how reporters were able to meet with Jiang when his relatives and lawyers were not. Xie was released in May after pleading guilty to charges of incitement to subversion and disturbing legal proceedings, and telling the same court he hadn't been tortured or forced into giving a confession. Xie's wife, who fled to the U.S., called the trial a sham and the U.S. State Department said Xie's confession "appeared to be given under duress." Jiang was a lawyer who took on politically sensitive cases, and defended blind activist Chen Guangcheng and followers of the outlawed Falun Gong spiritual group. He was disbarred in 2009, and became an activist and helped publicize the plight of lawyers arrested in the crackdown that began in July 2015. 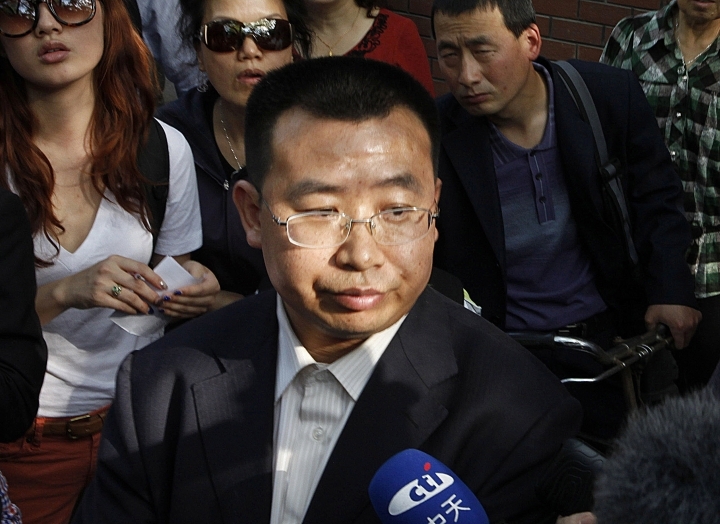 Jiang's friend, former lawyer Liu Xiaoyuan, said that Jiang's case was being dealt with much faster than that of other lawyers, such as Wang Quanzhang, who has been detained since 2015. Liu said the unusual broadcasting of clips of the case on Sina Weibo meant there was an expectation Jiang would admit guilt. Despite it being billed as an "open" trial by the court, Liu said a lawyer had applied to attend the hearing but was refused, and that authorities had blocked off the roads surrounding the court. Diplomats from the embassies of the U.K., Canada, Switzerland, the Netherlands, the U.S. and Germany had sought to attend Jiang's trial, but were prevented from getting even close to the courthouse because of the sealed-off roads, a Western diplomat said on condition of anonymity due to the sensitivity of the case. AP writer Gillian Wong and news assistant Fu Ting contributed to this report.